We keep hearing near panic pronouncements about interest rates soaring should the Fed start tapering. Interestingly, one could make the argument, and one has, the end of taper will lower inflationary expectations, i.e. because of fewer reserves being thrown on the market by the Fed, and thereby interest rates will move lower. I am talking long rates here. Long rates are driven more by inflationary expectations than anything else, over time. The Fed cannot control long rates because long rates are affected by inflation expectations, not by supply and demand in the market place. And when one considers the ongoing attempts of the market to purge global imbalances, which is a deflationary process in its own right, and then considers the existing supply of all kinds of things—reserves, labor, capital, capacity etc. etc. It’s hard not to conclude deflationary pressures are likely to continue for the next several years, not quarters. The evidence of the global economy's growth-stunting tendencies is abundant. For example, in my recent book The Age of Oversupply: Overcoming the Greatest Challenge to the Global Economy I refer to the "triple hoarding" of U.S. dollars in (i) the over $3.5 trillion held in foreign currency reserves; (ii) the nearly $2 trillion in excess domestic liquid assets held by nonfinancial U.S. corporations (together with perhaps another $3 trillion held in liquid form by U.S. business interests outside of the United States) and (iii) the trillions of dollars of uninvested household wealth, 75 percent of which is held by the top 10 percent of households. And I don't blame any of the foregoing holders for not investing their money in new capacity (factories, equipment, offices, etc.) on a scale large enough to move the global needle. There is, after all, nothing very sensible for them to invest in, given the existing oversupply. Similar points can be raised with respect to the world's secondary reserve currencies, the euro and the yen, but the numbers are of course far smaller. This leaves the developed world with a dilemma. Either allow the pricing mechanism to clear the market of excess (which would mean wage, price, and asset deflation in the developed world, instead of the mere disinflation we have become familiar with) or find some other way of getting excess capital invested into their real economies to return to production potential. To date, our illustrious government and central bank policymakers have a very poor track record when it comes to letting the market clear—something the Austrian School types (like me) have been wishing for to no avail. 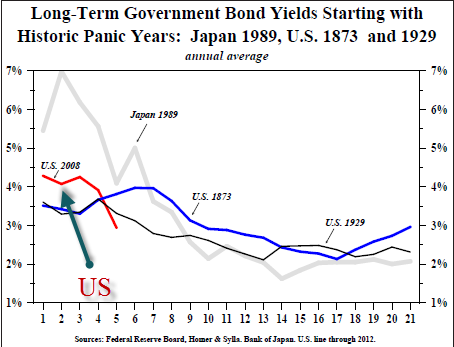 “In the aftermath of the debt induced panic years of 1873 and 1929 in the U.S. and 1989 in Japan, the long term government bond yield dropped to 2% between 13 and 14 years after the panic. The U.S. Treasury bond yield is tracking those previous experiences (Chart above). 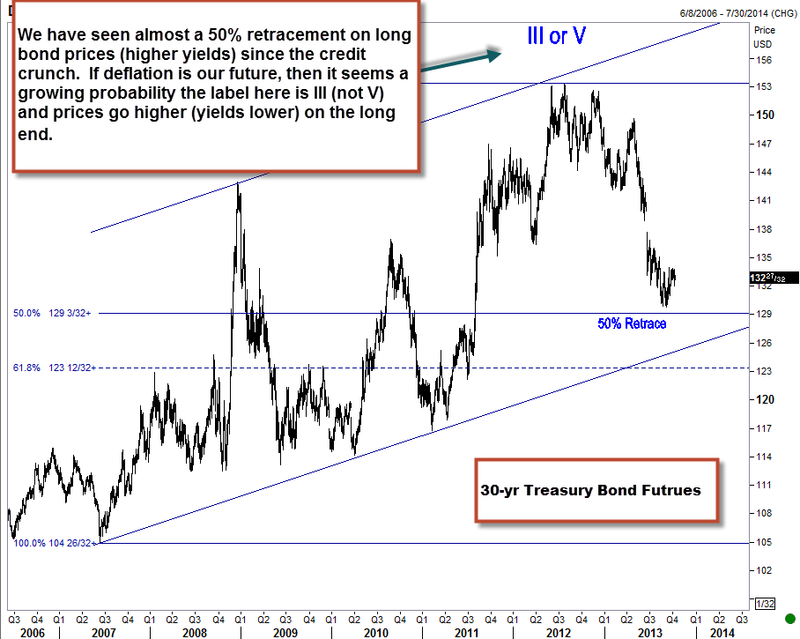 Thus, the historical record also suggests that the secular low in long term rates is in the future,” writes Hoisington. And would it be a shock to see any deal to reduce US government spending be reflected in higher bond prices (lower yields) even over the near term? I don’t think so. It sure isn’t boring out there, that’s for sure. Newer PostTaleb knows Fragile. And we are fragile.